No matter the area in which you live in, you are bound to come into contact with at least one type of severe weather throughout the year. Events such as Hurricane Katrina have shown us that having an emergency plan could mean the difference between saving your pond and total destruction. Preparing for smaller storms, and storms that you have more notice on is somewhat easier than preparing for a large storm. Taking a few simple steps will help guide your pond through the storm. 1) Stop feeding your fish. Your pond contains enough natural food sources that your Koi will not starve for a long amount of time. If the storm does any damage to your filtration process, not feeding you fish will cut down on the chance of any ammonia problems later on. 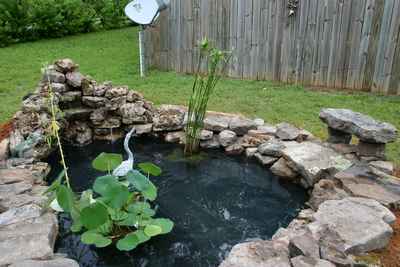 2) Do as big of water change as possible to your pond. In the case that something goes really wrong and you are unable to attend your pond right away, your Koi will have the freshest water available to them. Also, leave out several inches of water to make up for coming rainfall. This way, there will be less chance of your pond overflowing. If you have some type of drainage system, make sure to clear it of any debris so it will work at it’s full potential. If you pond is ground level and high waters are expected, you can add protection by sand bagging around the area. If nothing else, this may keep your koi confined within the area if flooding occurs. 3) Net over your pond to protect it from any flying debris. Using the same net you use during the fall to keep leaves out should suffice, as long as you properly secure it down. 4) Remove anything that could potentially blow over, away, or fall into your pond. A good rule of thumb, if you can push it over, so can the wind. Items that could blow away should be completely removed from the area and placed indoors. Large storms like the recent hurricanes prevent any type of preventative measures from being successful. The only real way to save your pond in these types of events is completely remove your fish from the pond. First, it is always a good idea to have all the equipment needed to transport your Koi on hand. If you are having an emergency with your Koi, you may or may not have time to make a trip to your local pet store to gather what you need. The equipment needed to bag and transport Koi is small, and easily stored when not in use. Bags- You must have the proper bags on hand to transport Koi. Do not attempt to transport your Koi in the trash or regular plastic bags, as they are not designed for this, and may cause damage to your Koi. Unless you remembered to keep the bags you brought your koi home in originally, you will have to make a trip to your local pet store. Make sure to get bags sizable enough to hold your Koi. Rubber Bands- You will need quite a few rubber bands for each bag you buy. Make sure that your rubber bands are good quality, as you do not want the pressure from the water to pop the rubber band in the middle of the transport. Net- You will need to have a net sizeable enough to compete with your Koi. You will never need the net to pull the Koi out of the water with, but you will need it to lead and direct your Koi into the place you want them. Nets can potentially damage your Koi, especially as the larger they get. Paint Bucket- A paint bucket is a better option for catching your Koi, as they cannot hurt your Koi like a net can. Make sure that your bucket is sizable enough to hold your Koi. Summer is considered one of the best and more vibrant times for your Koi pond. Temperatures are beautiful, and you are more able to enjoy your pond then during the cold Winter months. However, by no means, should your maintenance drop during the summer months. Remembering a few things during the summer months will ensure that your pond stays beautiful and lively. One way to keep oxygen moving into your water is by installing water features such as waterfalls and fountains. The more the water is moving, the more Oxygen is available to your Koi. It is especially important to pay attention to your Koi if they start developing noticeable spots or changes in their body. They may also knock fins off. To remain healthy during the summer, you fish will need food high in the types of nutrients that they need. During the summer you should feed your fish a food that is low in protein at least one to three times a day. If you fish still seem hungry after feeding, you may want to increase feeding slightly. The location of the water garden is critical to its ecology and maintenance, as well as to your enjoyment of it. Sunlight is needed for plant photosynthesis. Plants are important to the water garden’s ecology because they produce oxygen, remove and recycle nutrients, and provide shade and hiding places for fish and other inhabitants. A water garden should be situated to receive at least 6 hours of sunlight each day. Water gardens should not be located over utility services. Check with utility companies for the location of underground lines. Water gardens should not be located directly under trees because roots hamper excavation and may cause structural damage later. Also leaves foul the water and over-hanging branches may exude toxic substances into the water garden. Construction of a water garden can be simple or complex. Water gardens built of fiberglass or concrete take considerable construction skill. Earthen and plastic liner pools require less construction skill or experience. Many commercial firms selling water garden equipment offer consulting services on design, construction, and maintenance. Use available expertise and your own creativity to design a water garden reflecting your imagination and taste. Water gardens can be relatively expensive to build and maintain. Cost of construction varies with size and the materials used but can range from a few hundred dollars to many thousands of dollars. Construction plans should be reviewed by local governmental agencies to ensure that the proposed pool complies with all building codes. The first consideration is a supply of good quality water to fill the pool. The most common sources are city water and well water. Surface water from a creek or pond is not recommended as it may contain contaminants, diseases and wild fish, any of which may harm the water garden’s ecosystem. If city water is used it must be dechlorinated before adding fish and plants. One common mistake is stocking too many fish. A water garden is suitable for fish only as long as it can supply adequate oxygen and decompose the wastes produced. 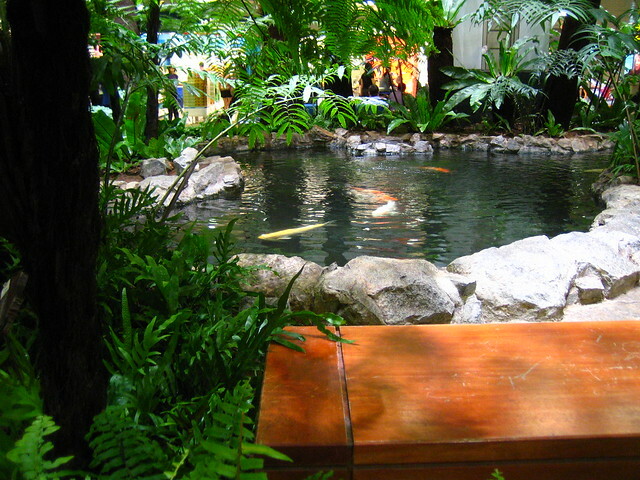 The number of fish the water garden can support depends on factors such as the size of the water garden, size of the fish, temperature, amount of sunlight the water garden receives, whether or not aeration is provided, and how well the natural or artificial filtration system removes wastes. Herons are beautiful, majestic birds that have one major flaw. Herons love to feast on Koi, and where better than to find Koi then an unattended Koi pond or garden? When you first notice a Heron in your garden, you may not even think of these birds as a danger. Herons are 2 or 3 feet tall, with an extremely large wingspan. They appear to be extremely graceful until you realize that the beautiful sight you were just looking at could have potentially been a thief caught in the act. If you noticed that your fish are missing in action, chances are a Heron is to blame. You may even notice large gaping holes in the sides of your Koi. This happens when a Heron attempts to catch one of your Koi but does not get a good grip on it. The other will notice their Koi laying on the lawn several feet away from the pond, which is the result of a Heron dropping the Koi after removing it from the pond. While nothing can completely stop this from happening, you can do a few things to detour Herons from eating your pride stock of Koi. While there are many types of technical equipment available to attempt to detour Herons, you will quickly find that these types of detours will only work for a small amount of time. Some pond owners place a fake plastic Heron into their garden. This is supposed to detour another Heron from landing there. This works for parts of the season until the mating season comes. Herons will be more likely to land near your plastic Heron when they are looking for a mate. Various other types of equipment attempt to detour Herons by causing them discomfort. This only works until the Heron get used to it, or just finds a way around it. The only way to protect your Koi is by watching out for them. A few simple things will not prevent Heron from visiting your pond, but it will greatly reduce the presence of them. 1) Constantly change your routine. Herons are smart and know when you will typically be present. Visiting your pond frequently at various times during the day will greatly increase the chance that you will catch the Heron in action. If you are unable to vary your routine, you may consider enlisting others to visit your pond as well. Older, trustworthy children in the neighborhood may delight in visiting your pond at various times of the day. Giving them permission to visit whenever they want will allow others to visit when you are unable too. 2) If you catch a Heron in the act, make as much noise and frighten the Heron as much as you physically can. Shout, yell, throw things, or whatever you feel will scare the Heron. The more frightened the Heron is, the less chance he is to return anytime soon. 3) Create a hiding place in your pond for your Koi. More natural Koi pond owners have noticed that after a Heron attacks a pond, it may seem that the Heron has got all the fish, only to notice that the Koi start appearing from strange hiding places once the scare is over. If you purposely provide a place for your Koi to hide in the event of an attack, you greatly reduce the amount of fish that a Heron will leave with. Do not worry about your Koi hiding from you, as they should know and trust that you will not hurt (or eat) them. 4) Do not restock your pond right away in the event of a Heron attack. Waiting to restock may send the Heron searching for new feeding grounds. First, you must understand that Koi ponds are not just simply holes in the ground that you can keep fish in. For a Koi pond to work properly, and actually sustain fish, a number of different things must be considered when you begin planning it. A few simple rules will ensure that you do not end up with an expensive hole with dead fish. First, unless you have a large amount of knowledge in outdoor landscaping, fish keeping, and construction, it may be a good idea to leave the pond building up to a professional. While some people think that building the pond yourself with save you money, this could not be further from the case. If your pond is not built properly the first time, you will end up spending a large amount of money on fixing the problems that come up. Not only that, if your pond is not properly setup, you may not even be able to keep fish alive. Remember when you hire a professional, it is their job to give you what you want. They can give their knowledge when it comes to decision making, but ultimately, they will do whatever you want them too. Because of this, you cannot blame them if your pond fails to do to location, size, or other factors. However, beware of extremely cheap quotes as they may cut corners that could potentially cause you problems later. While quotes will come in different, there should not be a very dramatic difference between them. Koi ponds are by no means, swimming pools or animal water troughs. This is the reason why so much care must be taken in planning and building your pond. It may cost more money then building a typical swimming pool, but the rewards are much greater. Be sure to keep all children and other none fish pets out of the pond, as they can cause problems. If your children swim in your pond, not only could they cause a chemical imbalance, but they could also cause major problems such as leaks. While it is typically ok to have other pets around your Koi pond, some pets may get the idea that is fun to mess with your filtration system or chase your Koi around. Remember, the majority of Koi ponds are permanent once they are built. This means that you cannot decide in two or three weeks that you do not want you Koi pond in the front yard, that you would rather have it in the backyard. Carefully plan each and every aspect of your pond, because once it is built, there is little you can do to change it. Remember such things as size requirements and placement. Finally, remember that maintaining a Koi pond can be a substantial amount of work. Make sure that you will have enough time to carry out the everyday needed maintenance, and remember that, like with any other pets, issues will arise that require extra special attention. Vet visits may be needed, or you may need to take some extra time out of your weekend to clear up an algae infection. Have a plan, and make sure that if you are going to be going away, make sure someone with enough knowledge to properly maintain your pond is available until you return. So you finally finished your water garden construction. You have finally come to the fun part of creating your water garden: picking the flowers and plants that will make your water garden a beautiful oasis. Not only should you consider beauty when you are picking your plants, but you must also remember that plants provide another, more important value to your garden, biological life. Biological life helps maintain your pool by doing what they would do in nature. Be sure to pay attention to your climate and area. Some plants can simply not survive in certain conditions, so it is wise to do your research beforehand. Talking with your local dealer will give you some idea of what plants you can and cannot have in your pond. Undoubtedly, since your pond contains Koi, a tropical fish, you may want to keep with the theme and place Lotus plants in your pond. Pretty much everyone with a tropical water garden will want a Lotus plant because the beauty is simply unmatched by other flowers. Lotus plants provide beautiful blooms and a smell that is unmatched. However, unless you live in an area that sustains temperatures higher then 65 degree Fahrenheit, you will need to have to have a place to house your Lotus plants during the colder months. A greenhouse setup specifically for water plants will work the best. Lotus plants require soil and a large amount of sunlight. They should be planted in water about 2 to 3 feet deep during the warmer months, and indoors during the colder months. If you simply do not have the time to plant and maintain your water garden’s foliage, or you are somewhat lazy when it comes to gardening, you may want to consider adding Water Hyacinths. Water hyacinths have become very popular recently because of their simplicity. They do not require any type of soil or planting, you must simply throw them into the water. Only minimal time is needed to anchor them down so that they do not float all over the pond freely. Water Hyacinths are not only pretty but are also very functional as well. These plants aid in the fight against both algae and blanket weeds. One downside when having Water Hyacinths is the fact that they will take over your pond and yard if you allow them. Water hyacinths are very invasive and will spread if allowed. In extreme cases, it may even jump the fence and take over the neighbors yard as well. Once they have caused this kind of infestation, it is notoriously difficult to get rid of them. Alternatively, you may want to consider investing in plants that are not necessarily seen. These plants live below the water line and provide many needed functions to your pond. Some help you battle algae, put oxygen back into the water, or feed your fish for you. You can find these plants in bundles at your local pet store or Koi dealer. The majority of underwater plants will not need additional support during the winter, so once you place them in the water, you may not think twice about them again. However, the benefits that you gain from having these types of plants make up for the fact that you are not able to actually see them. Population control is typically easy with the majority of domesticated pets. It is usually as simple as removing the possibility of conception until the time in which the opportunity has passed. Unfortunately, this is not the case with Koi. Koi, no matter whether you want them to or not, will spawn and lay eggs, and other Koi will fertilize them. It is natural, and there is little you can do. Since contraceptive methods are not available for fish, population control really comes down to removing the unwanted babies after they are already born. As a newcomer to this hobby, you may simply disregard this information. For whatever reason, whether it is that you feel removing unwanted babies is cruel, or if you believe that the more fish the merrier, you will quickly realize that keeping all the babies that are born could be a potentially harmful situation to both your pond and the original parent fish. Why Are The Babies Harmful? What is so harmful about having more fish your originally started with? Well, a number of harmful situations can happen. First, Koi can and will grow to us to three feet in length. Koi, unlike some other fish, will grow, no matter the size of their habitat. This will turn a beautiful pond in a wasteful, extremely overpopulated pond. Not only will to many fish cause damage to a smaller pond, but they will not be comfortable in their habitat. When you originally set up your pond, surely you set the filtration system up for a specific amount of fish. Adding extra fish without adding more to your system will ultimately cause a surge in unwanted gases and chemicals in the water that is dangerous to your Koi. There are several ways of removing babies from your pond. One way is to stop feeding your Koi the minute you realize that spawning has occurred. You should stop feeding you Koi for no less than three weeks. Do not worry about your Koi starving, as they will focus more on natural foods if you are not feeding them daily. This “natural” diet includes their young. Koi are not cannibalistic animals by any means, but they will eat their young when they are still eggs or if they are small and resemble insects. Once the baby Koi actually resemble real fish, and the adult fish recognize this, they will no longer see them as food, so it is important to start this process as soon as you notice spawning or babies. First, check with your local pet store. Many pet stores have programs in which they will accept unwanted animals and give them good homes. Some may even pay a certain amount for each fish since they sell them but do not count on this. Local zoos may also have programs. The first Koi were produced by breeding Carp such as the Asian and German Carp. After years of selective breeding, various color mutations started showing up. The first colors were recorded as early as 1805. Today, there are literally thousands of color variations available. The most popular colors found are white, silver, yellow, orange, red, black, blue and green. Combined with the patterns available, the possibilities are almost endless. Each noticeable pattern and color have their own names, which are typically as unique as the color they are referring too. Favorite types vary by country and location. Koi are raised for purchase in countries like Japan, Singapore, Israel, and in the warmer American states such as Nevada and California. Koi can be purchased at most local pet stores. If they do not have stock on hand, typically they can be ordered. Ordering Koi has its advantage and disadvantages. You have more options when ordering Koi since you do not have to pick from the stock on hand, but the disadvantage lies in the fact that you will not be able to pick specific Koi. Your pond should be complete before you even look into buying your Koi. The size and amount of Koi you buy should be higher based on your pond. Be careful, overstocking will cause problems right away with your pond, potentially killing many of the Koi you purchase, causing you to lose time and money. Talk with your local dealer about your setup so that they can inform you on the amount of Koi in which you should have in your pond. Most fish owners understand that most fish will only grow to the size of their enclosure. Koi, unlike other fish, will grow until they are the size of their specific type. You must be able to accommodate the amount of fish you purchase in the future. Koi are none-aggressive fish. Koi do not have teeth so you will not get bit if you decide to attempt to feed your Koi out of your hand. This even allows you to get smaller children involved. Smaller children will be delighted by the beautiful colors and gentle nature of the Koi. Koi, like any other wild animal, will naturally be afraid of you in the beginning. Instincts tell them to be afraid of you, which is what keeps them alive in the wild. You must build up trust with your Koi, and this takes time and patience. Koi are omnivorous fish, which means they will eat both meat and plants. This means that their diets are very versatile. Koi will eat pretty much anything that you put in the pond with them, no matter if it is good for them or not. Since Koi do not have a sense of what is bad and good for them, as their owner you must control their diet. You would not believe that Koi actually have personalities similar to other animals. They are social, and can even be trained to eat directly from their owner's hands. The more time you spend with your Koi, the more you will notice each Koi individual characteristics and traits. Koi have been known to live for up to 200 years at a time, but generally, the average lifespan of a healthy Koi is about 30 years. So if you are looking for a long time pet companion, Koi may be a good choice. You perfect Koi pond starts with the actual pond itself. You have to create a pond that will not only be pleasing to the eye but will also adequately sustain Koi. Proper placement, size, and pond type are essential when building your pond. Unless you have a large amount of knowledge in outdoor landscaping, fish keeping, and construction, it may be a good idea to leave the pond building to a professional. While some people think that building the pond yourself with save you money, this could not be further from the case. If your pond is not built properly the first time, you will end up spending a large amount of money on fixing the problems that come up. Not only that, if your pond is not properly setup, you may not even be able to keep fish alive. Knowledge is power when it comes to Koi keeping . It is important to learn as much as you possibly can about the hobby before jumping in with both feet. It is important to learn the information yourself rather than relying on other sources. People such as your product dealer and pond builder will have limited knowledge, but should not be trusted for a reliable source, as they are selling products and may be biased. Plus, once you are at home with your Koi, your product dealer or pond builder may not be available to help you in the event of a problem. Once you have created the perfect environment, you will need to start looking into buying your fish. It is important to remember never to purchase too many Koi because they will grow rather large, and they breed almost yearly. Overpopulating your Koi pond will cause serious problems in the future. Do water tests at least on a weekly basis. This will allow you to notice discrepancies in the test results long before your pond starts showing symptoms of stress. This will potentially save not only your pond but your fish as well. Koi can be fed treats such as fruit, veggies, bread, and store-bought treats. Koi can literally be trained to eat directly from your hand. This takes time and patience, but will ultimately provide entertainment to you and your visitors. Making sure your pond is ready for the coming seasons should not take you more than a weekend to complete, and will ensure that you have a successful water garden for the remainder of the year. Your Koi pond will literally come to life at the first of springtime. The Living organisms in your pond have spent the previous winter in a proverbial hibernation, and are ready to come to life at the first signs of warm weather. This is the perfect time to begin maintenance on your pond before the fish, plants, and other pond life come back to life from their winter slumber. As the days begin to get warmer, your pond will start drastically changing. If you are not careful, you may miss this much-needed opportunity to perform maintenance. Generally, watch for temperatures around 50 degrees, as this is the perfect time. The maintenance needed on your pond will largely depend on what happened during the previous winter. If the previous winter was hard, chances are you will need to perform more changes so it may be a good idea to start as soon as you start noticing the weather changes. However, some spring maintenance will have to be completed every year, no matter how harsh or how mild the previous winter was. You may notice that the water in your pond is extremely clear when the seasons are changing from Winter to Spring. Do not let this fool you, as there are several factors that will actually cause problems once Summer comes if you do not remedy these issues ahead of time. During the Fall and Winter months, the organic material such as leaves and plant material may have found its way into your pond. While the water seems clear at the time, the organic material placed a large number of nutrients into your pond, which will cause a surge of algae growth once spring arrives. If algae were not enough, a large amount of organic material in your pond will start to decompose and will reduce the oxygen content in your water. Since your water is perfectly clear, it is the perfect time to clear all of this unwanted debris and slit from your pond. This can be completed a number of ways. 1) Hire a pond professional from your local dealer or pet store. They will have the equipment needed to vacuum the majority of the debris and slit out of your pond. While this is a more costly option, you will have the assurance that the majority of the problem causing material will be removed from your pond. 2) If hiring a professional is not an option, you may want to consider using a fine mesh net to scoop up as much debris as possible. The only issue is most nets will only stir up the slit in your pond, rather than remove it. Once you have removed unwanted debris, you must then test your water. Winter seems to cause the pH levels to change. At the start of Spring, your pH level should be an 8. This can be achieved by topping your pond off with treated tap water which is buffered to be slightly alkaline by your local water company. Springtime is a very weak time for your fish, because they have not eaten for months, and have maybe lived on a low level of energy. This causes your Koi to be more susceptible to attacks from organisms such as bacteria, parasites, viruses, and fungi. This makes Spring the opportune time to take all preventative measures possible. Adding a large spectrum of treatment solutions will greatly reduce the amount of disease-causing pests and material. Once the temperature warms up, another dose of this treatment will ensure that your Koi will be well protected while they redevelop their immune systems. Once temperatures warm up, your Koi immune systems will be effective enough to protect themselves from a disease. The word "Koi" means "carp" and originates from the Japanese language. The nomenclature indicates both the brightly colored Koi types and the dull gray fish. In Japan, the fish are called nishikigoi. The literal translation of nishikigoi is "brocaded carp". Koi in Japan means love or affection. Koi in Japan are symbols of love and affection. They have also become a popular subject for tattoos. The common carp was grown for a food fish in China as far back at the fifth century. It has been concluded through scientific study that there is a minimum of two different subspecies of carp. One is from East Asia and another from Eurasia. Through continuous cross-breeding, the various varieties have evolved. Through the study of mitochondrial DNA, it has been learned that Koi are descendants of a variety of hybridized species. The characteristics that distinguish the Koi are scalation, patterning, and coloration. The primary colors of Koi are black, white, yellow, red, blue and cream. The color combinations are unlimited. Breeders have taken it upon themselves to identify certain color combinations. The most popular of the Koi varieties are the Gasanke which consists of the Taisho Sanshoku, the Showa Sanshoku and the Kohaku varieties. The crossbreeding has continued. As recently as the 1980's, Ghost Koi was developed in the UK. They are a cross between the wild Koi and the Ogon Koi. Their metallic scales are what distinguish them from other Koi. The dragon carp, which is also known as the Longfin Koi or the Butterfly Koi have long flowing fins which distinguish them from the other varieties. There are those breeders that do not consider the butterfly Koi and ghost Koi to be true Nishikigoi. The development of Koi types continue and the variety of choices increases. There are some who feel that the original Koi types are the only true Koi. Kohaku: This popular white Koi has red markings on the top of its body. the name Kohaku means red and white. This original Koi developed in the 19th century. Taisho Sanshoku is also known as Taisho Sanke. In 1914, breeders introduced these types of Koi. They are similar to the Kohaku but have additional black markings. These small black markings are called Sumi. In the United States, they are frequently called Sanke. The kanji can be read as Sanshoku or sanke. Showa Sanshoku is a black Koi. It has red and white markings. These types of Koi was first shown in 1927 during the Showa empire. The amount of shiroji, white markings, has increased over the years. In the United States, the name has been abbreviated to Showa. Tancho Koi are distinguished by the single red patch that you see on the head of the Koi. The Koi in this category can be either Tancho Showa, Tancho Sanke or Tancho Goshiki. This Koi was named for the Japanese crane. The crane has a red spot on its head also. Chagoi is tea-colored Koi. The color covers a wide spectrum of colors from a very pale olive drab green to a copper or bronze hue. Recently some have appeared in shades of orange. These particular Koi types are friendly, docile and very large. Keepers like to keep them in their pond with other Koi varieties as they feel they are a sign of good luck. 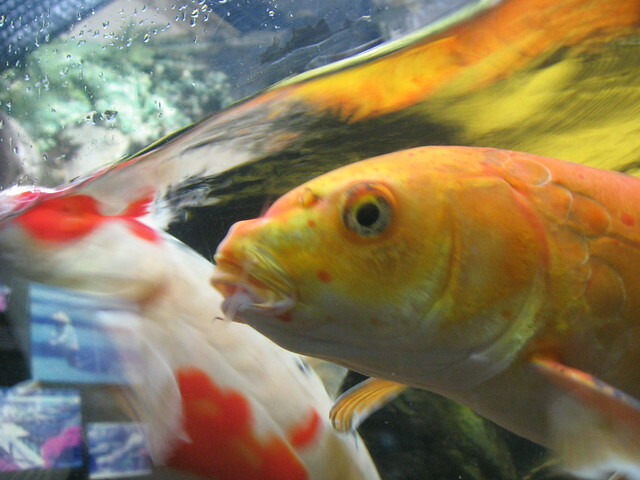 Asagi Koi is usually red, yellow or cream below the lateral lines of the fish and on its cheeks. The rest of the fish is a beautiful light blue. The name means pale greenish-blue in Japanese and also spring onion or indigo. Utsurimono Koi are black and have either white, red or yellow marking. The original is the black and white markings, called the zebra color. The red and white are Hi Utsuri and Shiro Utsuri. Utsuri means to print. The black markings are very similar to ink markings. These types of Koi are genetically the same as Showa but without the white or red pigment. Bekko is a yellow, white or red skinned Koi that has distinctive black markings. The name translates to "tortoise shell". The white, red and yellow Koi varieties are Shiro Bekko, Aka Bekko and Ki Bekko. Occasionally they are confused with Utsuri. Shusui translates to "autumn green". The Shusui appeared in 1910. It is a cross between the German mirror carp and the Japanese Asagi. These particular Koi types have one line of large scales that extend from its head to its tail. Adam Boyle is a Koi Fish enthusiast and enjoys helping others taking care of these wonderful fish. For more great information on Koi Types, visit http://www.koifishinformation.org.